Ronaldo 'Jacare' Souza played spoiler on Saturday night by handing Chris Weidman a TKO loss in his hometown of New York City. Ronaldo ‘Jacare’ Souza played spoiler on Saturday night by handing Chris Weidman a TKO loss in his hometown of New York City. While both fighters are known for having powerful ground games, this middleweight contender’s match turned into an absolute slug fest on the feet with a back and forth war for more than two rounds. With one of the deadliest ground fighters in the history of the sport in front of him, Weidman was focused on staying on the outside and using his long jab to keep the Brazilian at range. ‘Jacare’ ate a few of those straight punches early but he did manage to come inside with a couple of hard shots to the body and then coming back over the top to the head. Still, Weidman did far more damage in the opening round including a stinging right hand that wobbled the Brazilian jiu-jitsu champion while also busting open his nose during one of the heaviest exchanges. As the second round got underway, Weidman was once again landing with some serious power shots with another combination staggering ‘Jacare’ on the feet. Hurt or not, Souza refused to back down and he kept finding a way to counter with his big looping punches that started to find a home on Weidman’s jaw. Time and time again, Weidman would connect flush and then Souza would just come right back at him with an offensive flurry of his own. The ability to take a punch and then give one back in return paid off huge for ‘Jacare’ as he continued to press forward and as time ticked away, he began landing with more regularity and the punishment started to mount on Weidman’s face. 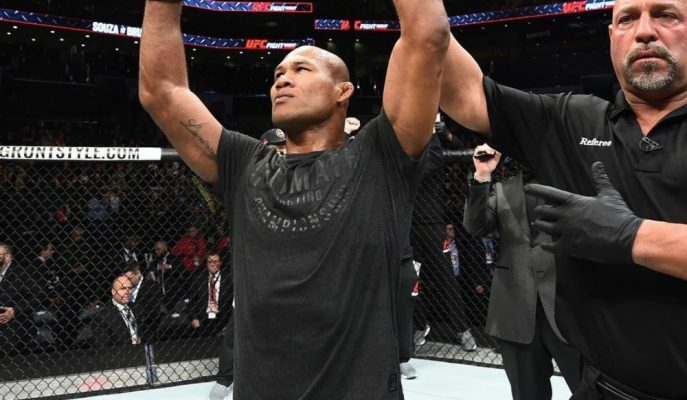 ‘Jacare’ was finally able to back the former champion up with his relentless pressure and with both fighters throwing punches, it was the Brazilian who connected with a shot that ricocheted off Weidman’s forehead and sent him crashing to the canvas. Souza wanted to stop throwing punches as Weidman was obviously down and out but referee Dan Miragliotta refused to stop the contest so he was forced to blast away with a few more hammer fists before the fight mercifully ended. The official time was 2:46 into the third round. It was an awe-inspiring show of heart and determination from Souza to endure those early rounds to get the finish late in the final frame. The win undoubtedly puts ‘Jacare’ back in the title hunt with middleweight champion Robert Whittaker facing Kelvin Gastelum in early 2019. As for Weidman, he’s now 1-4 in his past five fights while the former champion has been unable to get a win during his two trips to Madison Square Garden.